H&H Land and Property, in association with AWS Power and Clydesdale Bank, is hosting a farm educational tour on March 26th with Anaerobic Digestion (AD) as the focus. The visit has been specifically tailored for farmers who have shown a strong interest in looking at Anaerobic Digestion technology, and is part of an ‘Ask the Expert’ series of events being organised by Victoria Lancaster, Renewables Consultant for H&H Land and Property. AD works symbiotically with dairy farming, and for farmers who have land suitable for growing silage and arable crops, so is an excellent energy source for Cumbrian and Border farmers to consider. Through AD farmers can benefit from both the RHI and from FITs so it actually provides them with two additional sources of income. “The day’s programme will be of specific interest to dairy farmers, and anyone who grows silage or arable crops in large quantities. Farmers with pig and broiler units can also benefit from AD so they are more than welcome to attend.” says Victoria. After a lunch at Harrison and Hetherington’s Borderway Auction Mart the group will travel to two farms to see a 500kW and a 100kW slurry/silage system. Brothers Steven & Mike Little of W C Little & Son, Kirkbride House, Kirkbride run a 250 cow dairy herd along with a large agricultural contracting business and a 500kW Biogest AD plant. The AD plant was built and commissioned in 2014, giving the brothers another income stream to their farming and contracting enterprise. Based on a feedstock of slurry from the dairy herd, silage and whole crop cereals, the AD plant has enabled good crop rotation to the farm land without requiring any imported inputs. The Littles can see the long term financial stability that AD offers to the farming enterprise, which will be further bolstered when they start utilising the heat generated from the AD plant. At Justicetown Farm, Westlinton, David Coulthard runs a 300+ herd of high yielding Holsteins, housed all year utilising robot milking equipment. This system gives the cows a relaxed and comfortable environment delivering consistent high yields. 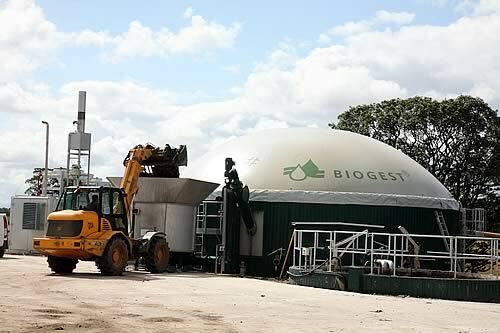 The 100kW Biogest AD plant based on a predominantly slurry based feedstock with a small amount of silage, maize or rolled barley fits well into the farming system, with a supply of cheap electricity and a consistent quality digestate. “AD is a good diversification option for dairy farmers and those who produce forage. During the tour we will be demonstrating two distinctively different plants. Both use heat-generated fermentation to produce gas which may be used as a source of power, or as a means of generating electricity, both for on-farm consumption or for feed in to the National Grid. During the day there will be Q&A sessions, where the experts and host farmers will discuss the challenges that they may have faced and the opportunities that it has given them. Places will be allocated on a first-come-first-served basis, so interested people should get in touch as soon as possible.